"Kanagawa — specifically, the port of Yokohama, of which the Kanagawa Culture Center commands a view — is a gateway to the world. It was there that I renewed my commitment to carry out the Daishonin’s injunction to propagate the Mystic Law throughout the entire world. 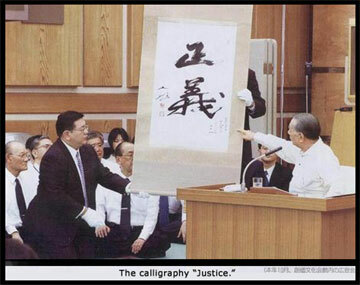 "And it was there that I took up my calligraphy brush and wrote the single word 'Justice' in Chinese characters. I entrusted the small group of disciples at my side with the mission of passing on and conveying to later generations the spirit with which I wrote that word.